Today, I got to take a tour of the engine room. The first thing I noticed was how amazingly clean the forty-year old engines are kept. This is definitely a crew that takes pride in keeping their ship shipshape! There are two diesel engines. Each engine is about the size of a small car. There are twenty fuel tanks scattered throughout the ship. The Rainier does not carry any extra ballast, so the fuel tanks are often leveled and balanced for ballast. The Rainier can hold up to 107,000 gallons of fuel. Whew! I definitely would not want to pay that fuel bill! The ship can go through 120 gallons of fuel an hour. Oil is recycled using an oily water separator that can hold 1,700 gallons. The engineering department also maintains the water evaporative distillers. These two evaporators can produce up to 7,000 gallons of freshwater (from saltwater) a day. The saltwater is heated to its boiling point and the evaporating freshwater is then cooled and collected. Normal consumption of freshwater for the ship is 3,500 gallons a day. Everyone tries to take quick showers. Toilets are flushed using saltwater. Faucets on the sink limit water usage by having to be held in the on position. You can’t just let water run from the faucet. 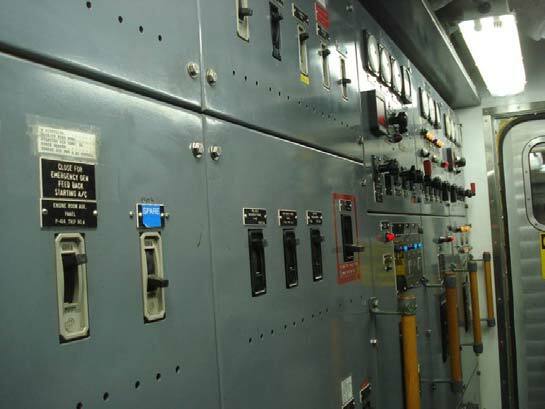 All of the electrical systems for the ship are monitored in the engineering control room. In an emergency, they can even control the steering of the ship. An incinerator on the ship also takes care of some of the wastes produced. In the mess hall areas, there are labeled bins for recycling plastics, mixed paper and burnables. Those items that are burnable get incinerated while we are out at sea. 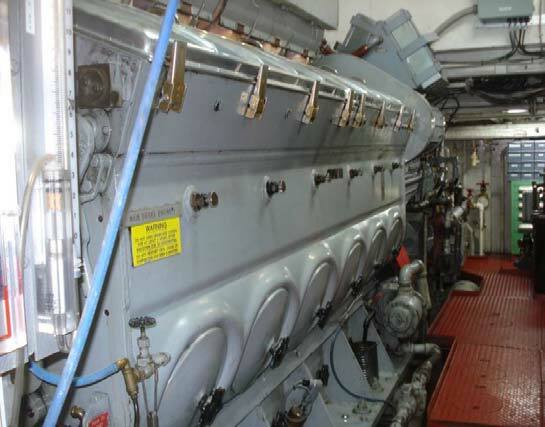 Not only does the engineering crew take care of the ship’s main engines, they also maintain and troubleshoot the six launch engines as well. 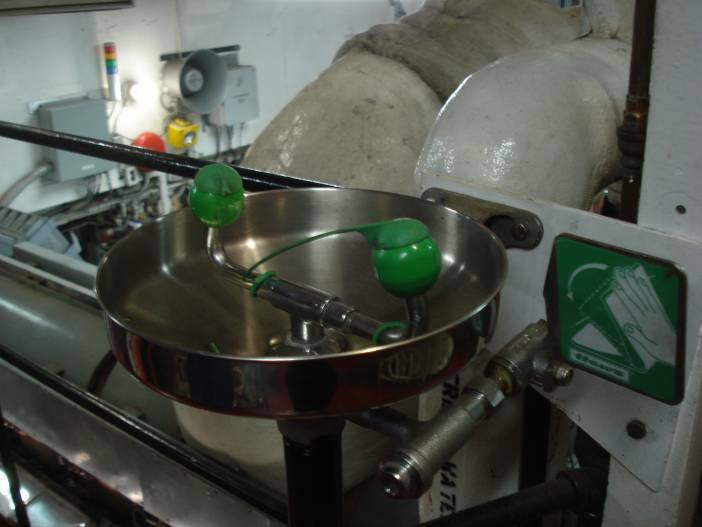 One of the first things I noticed in the engine room was the safety signs and equipment. No one could enter the area without hearing protection and I spotted several eye wash stations like ones we use at school. There were handrails and clear walkways and everything had labels. It’s great to see things we emphasize at school about safety are in the “real world” too. For this 18 day voyage, how much freshwater was consumed? 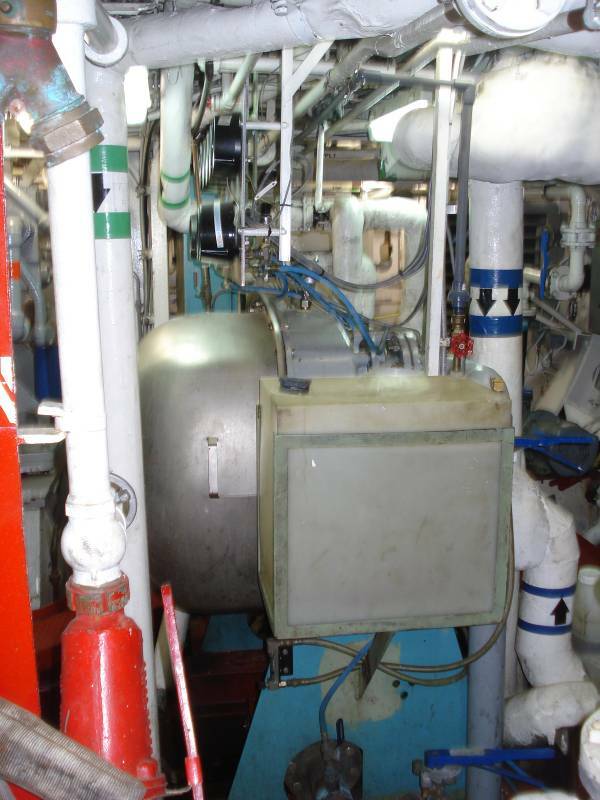 This entry was posted in 2009, Mary Patterson, NOAA Teacher at Sea and tagged Alaska, electrical panel, engine room, Hydrographic survey, multibeam sonar, noaa ship rainier, ship engineering. Bookmark the permalink.